Pizza is a perfect gathering food. It’s simple, fun and honestly, who doesn’t love it? Invite your friends over to make pizza and share a little pizza love. You don’t need a reason other than enjoying each other’s company. Open a bottle of wine and enjoy the process of cooking together. I recently hosted a dozen people and prepared pizza dough, sauce and topping for everyone so they could each make a personal pizza. It was a relaxed, casual event that produced a lot of laughter as they entertained each other with their brilliant pizza making talent. Here are my favorite pizza dough and sauce recipes. With a simple switch of the type of sugar used, they quickly become vegan without changing the taste. I use my stand mixer with the dough hook or my bread machine to knead the dough. Add the following ingredients to your mixing container. Stir to blend. Mix well and knead the dough for 10 minutes. The dough should remain slightly sticky. Form a ball with the dough and return it to your bowl. Cover the bowl with plastic wrap that has been lightly coated with olive oil to keep the dough from sticking to it as it rises. At this point, you can store in your refrigerator if you aren’t making pizza this day. While it’s in the fridge, punch it down when it has doubled in size. Reform the dough into a ball, cover and return to the refrigerator. Bring it to room temperature when you are ready to make your pizza. If you are using the dough right away, place the covered bowl in a slightly warm place to rise. Once the dough has doubled in size, punch it down. I made 8” rounds with ½ cup of dough. Make them as thin or thick as you would like and remember, they will rise a bit while baking. Use the remaining ¼ cup of flour to dust your section of dough to keep it from sticking to your hands or your work surface. Pat the dough to flatten it and stretch it into shape. It doesn’t have to be a circle. It can be organically shaped and still taste fabulous. Place the flattened and shaped dough onto a piece of parchment paper, add sauce, a tiny amount of cheese, then add the rest of your toppings and top with cheese. I like to sprinkle a bit of oregano and garlic powder on the top before baking. My pizza sauce adapted from “Nicoletta’s Molto Bene Pizza Sauce”. It is thick and nicely seasoned. I used about 1 tablespoon per 8” pizza. Cook on med-low heat until translucent. Do not brown. Stir to mix well. Cook over low heat for 30 minutes stirring often. The sauce is very thick. After 30 minutes, taste and add additional seasonings if necessary. ~To make it easy on yourself for your pizza party, make 8” rounds for your guests a day or more before your party. Layer the dough between sheets of plastic wrap and store in the freezer in an appropriate container, several days in advance. Remove them from the freezer a couple of hours before using them. If they begin rising after they thaw, return them to the fridge and take them out, as you need them. Pat them out slightly and stretch to shape before covering with sauce. 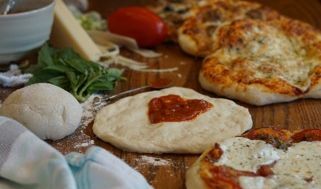 ~Give everyone his or her prepared dough on parchment paper placed on a plate to make it easy for him or her to handle. Move the parchment paper directly to the baking pan with the prepared pizza. ~Prepare the sauce, cut all toppings and precook any raw meat the day before. Lay out a variety of buffet of toppings when you are ready to make pizza. ~Remember that everyone’s pizza will not fit in one oven at one time. Determine ahead of time how many you can bake at once and have your guests rotate in groups, which often happen naturally. ~Create easy side salad options by adding greens and salad dressings to your buffet. Questions or comments? Did you enjoy your party? We would love to hear your stories!